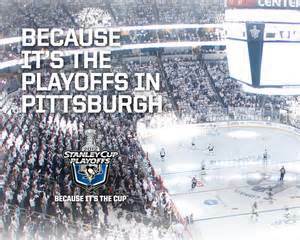 The Penguins WILL adapt their play-style....because it's the playoffs. Whenever two elite NHL teams play a spirited affair (as was the case last night between the Pittsburgh Penguins and St. Louis Blues), broadcasters and analysts tend to throw out the following observation: "The game had a playoff atmosphere." The description of "playoff atmosphere" suggests a mutually high compete level, with both teams actively trying to win the game (versus going through the motions ala the Buffalo Tankers Sabres). But what, in actuality, are the differences between a "normal" regular season game and an NHL playoff game? Do the two teams employ different strategies, try to score goals in different ways? Coaching plays a bigger part in the playoffs because teams almost always shorten their bench (limit who actually steps out onto the ice, as in, only the best players get to play). The Western Conference has been so dominant in recent years because the likes of the Chicago Blackhawks, Anaheim Ducks, Los Angeles Kings and St. Louis Blues have been able to consistently roll out four quality lines and win a nightly war of attrition against their opponents. The effects of skating 12 players versus nine are two-fold: one, the team with superior depth can make finishing checks a priority, thus physically wearing down the opposing 9, and more importantly, the top two lines of the deeper team play less minutes, allowing them to have greater jump throughout. In addition, whenever possible, each line will take a shift that is anywhere from 5-10 seconds shorter on average than a regular season turn on the ice. While that 5-10 second difference doesn't immediately sound like much, over the course of 10-20 shifts, those extra seconds of rest add up and provide for a higher energy level whenever those players jump over the boards. This adjustment of minutes is especially felt on the blue line, where teams with only two good pairings are likely to have those four players eat up anywhere from 52 to 56 minutes of play (with defensemen #5 and #6 only playing out what's left, and even then, only on an emergency basis). Why the radical change in player use? Simply put, a lot of fourth liners in the NHL just aren't very good (yes, we're thinking about you, Zach Sill), and when those not-so-good players are put into pressure situations via the NHL playoffs, they tend to collapse like "flan in a cupboard" (my regards to comedian Eddie Izzard). In this regard, the axiom of "playoff hockey" holds somewhat true, as playoff hockey places an onus on finishing checks and maximizing every player's 45 seconds on the ice. This is not to suggest that players take shifts off or cruise during the regular season- well, actually, it's precisely that. It's not unusual to see a forward cheat offensively during the regular season, which means that he is effectively gambling that his defensive teammates will make a play that sends him off to the proverbial goal-scoring races. In the playoffs, extra emphasis is placed on each player emptying the gas tank on every shift if it means denying the opposing team of an odd-man break or scoring chance. This means that back-checking (a forward making a defensive play during transition in his own end of the ice) is much more prevalent in the post-season, and more common among all lines as the stakes are significantly higher. This is where coaching comes into play: a coach is primarily responsible for deciding how to utilize his players, and in determining which spots to use his best offensive assets in an attempt to score goals. As I've previously written about, Mike Johnston and the Penguins' coaching brass apparently utilize Corsi stats to designate which players take faceoffs in various ends of the ice (hint: you should read that article), and during the playoffs, you might very well see Johnston flip his decisions and allow his best offensive players to take offensive zone draws in the hopes of scoring. Dan Bylsma was soundly criticized from 2010 onward about his inability to make adjustments, and that criticism was directed at both his personnel and offensive strategy: in short, Bylsma made the heavy assumption that his collective talent was superior to that of whatever his opponents put on the ice, and that his players would accordingly dictate the pace and style of play. Clearly, the Penguins' underachieving ways showed that Bylsma and his assumptions were ultimately wrong, and the cost has been Pittsburgh's early exits for the past 6 years and Bylsma's firing during this past off-season. The trials and tribulations of one Marc-Andre Fleury are not prototypical when it comes to the standard goaltending MO of the NHL playoffs. While teams have certainly changed goalies in situations of duress (the Pens using Tomas Vokoun, the Capitals using Semyon Varlamov, et al. ), the general primary directive of the netminder Star Fleet is to play every minute of every game unless the world caves in. Point #3 came to a head when the puck took a terrible bounce on Marc-Andre Fleury in Game 5 against the Columbus Blue Jackets last season, and the national media (in particular bloggers) were quick to assign blame to Fleury for attempting what he would have done each and every time during the course of every regular and post-season game. While the end-result was obviously disastrous, Fleury's decision was not. The tendency to judge Fleury based on the end-result instead of his (correct) decision-making is unfair, but it's the life of a goalie, as he will reap either the blame or commendations depending on the outcome. In the next Playoff Primer, I will focus on how goal-scoring changes once the playoffs begin, and the Penguins (and their recent post-season scoring woes) will be an interesting case study this spring.